Do you ever feel overwhelmed by all the craft projects that you want to complete? 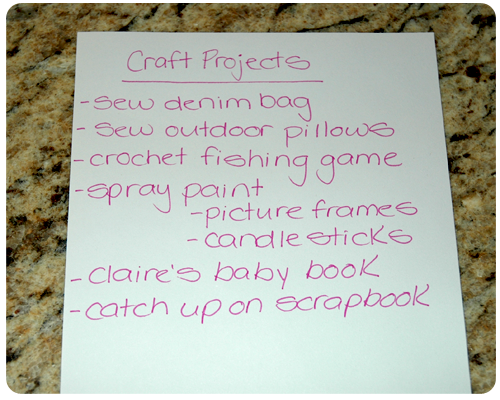 Last week I had a moment when I felt completely and utterly overwhelmed by my 'Craft Projects To Do' list. Was I ever going to get these projects done? When would there be time for these crafts? How would I fit them in between cleaning, cooking, laundry, work....all those everyday tasks that need to get done but that I would sometimes rather leave for more crafty endeavors? To battle this feeling I began by making a list of my projects. I then decided to not buy any more supplies or start any more projects until the ones on my list are complete; no sense adding to the pile. This makes so much sense, but sometimes I am lured in by the excitement of starting a new project and I buy supplies when there is already so much to be done sitting in the cupboard at home. 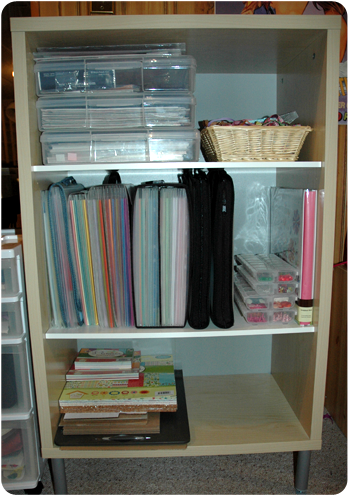 Finally, I cleaned up my craft area. Over time I had managed to spread out all over my basement...one table for paper crafts, another for sewing, and a pile of stuff in the corner that needed to be put back in its place. After a short while of sorting, putting things away, and tidying the towering piles of paper, fabric and random stuff, I felt better. Looking at a tidy and organized space is much more calming than looking at a disaster zone. And in cleaning up I found a previous list of 'Craft Projects to Complete' that I was able to stroke a majority of things off. That felt better, for sure. 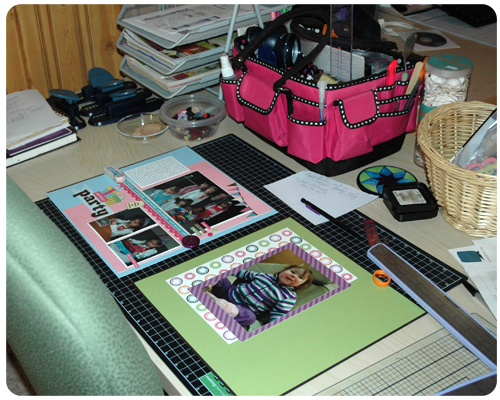 My craft table. It is never completely cleared off, but at least the supplies I no longer need are back in the cupboard and I can see my work space. I have already started working on my scrapbook catch-up....these pages are from January. Once things were under control I was able to take a deep breath and prioritize. The first thing I need to do is finish my youngest daughter's baby book (she turns three in a few weeks so it is high time) and then catch up on some scrapbooking which has fallen to the wayside while I have been working on my One Pad Challenge (click the box on the sidebar to read about this challenge). Making a list, deciding not to add to that list, and just tidying things up really helped me relax. I feel better now. What do you do when you feel overwhelmed by your 'Craft Projects To Do' list? Another wonderful week of making cards. 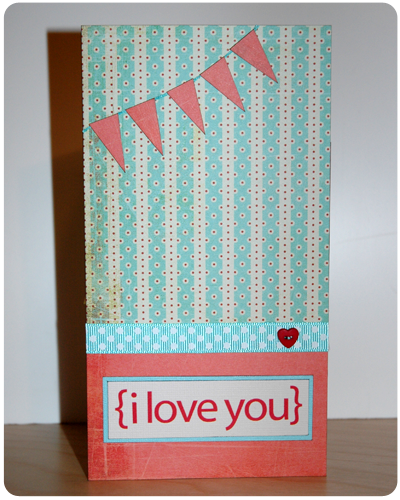 I finally got on the bunting bandwagon with this 'I love you' card. 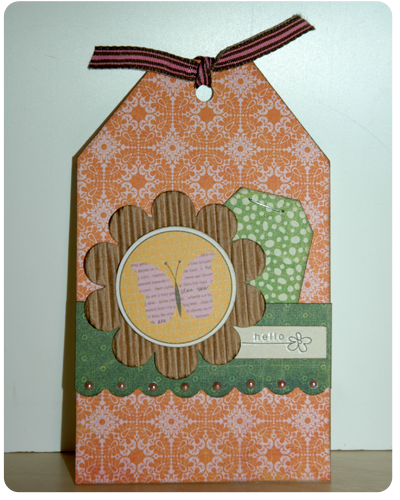 Buntings are everywhere in paper crafting - cards, scrapbook pages, mini books. They are so fun and such a simple embellishment; I'm not sure why it took me so long to use them. They were the perfect thing to add to the top of this card and I will definitely be including them in my designs in the future. This card is blank. I had it lying on my table for a couple days and kept trying to add a sentiment to it, but nothing looked right. When this is the case, I find it best to just leave it - the whole 'less is more' idea. I love how it looks. Very simple and elegant. And finally, another birthday card to add to my stash; I find birthday cards the most common card I need, don't you? I can never have too many birthday cards on hand. So, with this weeks' creations I am up to 24 cards and 5 tags. My pile of paper to work from is starting to look a little meager. I am looking forward to seeing what I can come up with using the remaining scraps. Until next week, happy card making! I always like to have a portable project on the go, and for the last few weeks this colorful, happy fish was it. I am still working on my Garden Patch Granny Afghan, but with all the color changes, the blocking and the seaming, it is not portable at all. 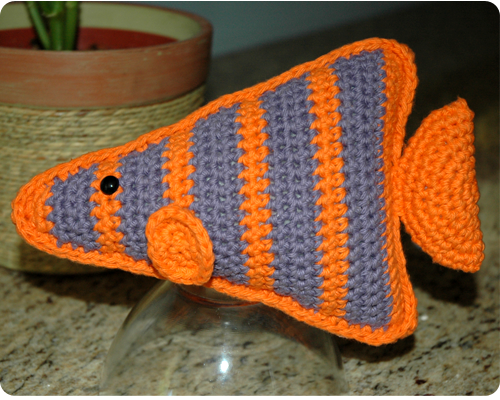 Smaller projects like a crochet fish (because who doesn't need one of those?) are just the right thing to take to a family BBQ, the park, or anywhere else where I may find a few spare moments to use my hook. The pattern for Fishy is from Lion Brand (Amigurumi Angel Fish). I used Bernat Handicrafter Cotton in Orange Chill and Purple Power. I must warn you - I have huge balls of yarn in these colors so they will be popping up in projects many times in the future. 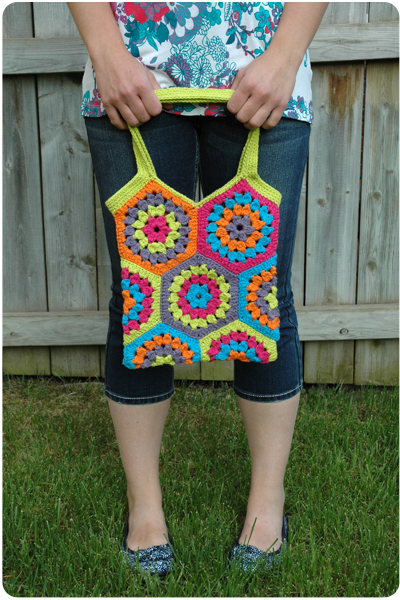 I already used them in my Colorful Granny Square Bag, and my Orange Monster. It has been a long time since I crocheted a toy and I really enjoyed working on this little fellow. I do love crocheting toys; they are quick to finish and so adorable. And they are the perfect portable project. Do you like my little Fishy? Have you crocheted any toys lately? Do you have a portable project that you are working on right now? Making cards this week was hard. 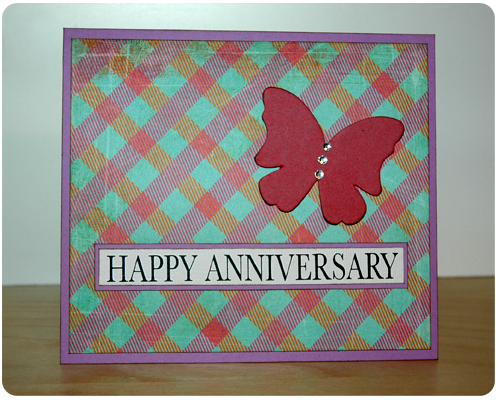 I always like to have a few anniversary cards on hand in the summer months, as there are so many anniversaries during this season. Of course, I can never have enough birthday cards in my stash. I am very pleased with how this card turned out. Finally, I put together this congratulations card. I love the button details. I am really liking buttons on my cards lately. They add just the right amount of dimension and fun. 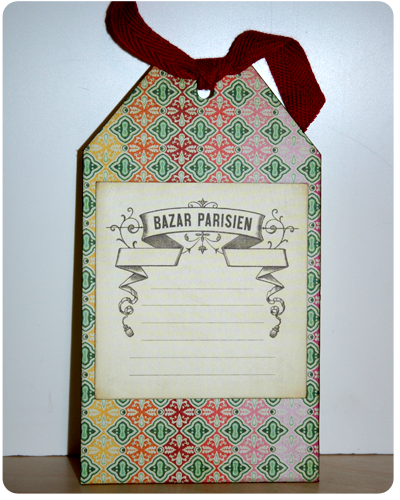 How many cards can a card maker make from one pad of patterned paper? This weeks creations brings the total to 21 cards and 5 tags. I love this challenge and all that it has created. Has anyone else embarked on a similar challenge? I would love to hear how it turned out for you and how many cards and/or tags you were able to create? My oldest daughter Bridget has recently learned to read and to celebrate this milestone, and show her how incredibly proud we are of her, I decided to make her a bookmark. My inspiration for this project came from this tutorial at Make and Takes - an incredible blog full of truly inspiring craft ideas. 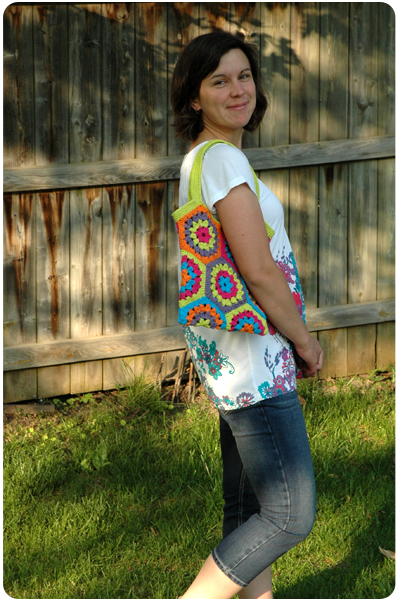 I did make a few alterations to the Make and Takes tutorial so I have provided my own project instructions here. 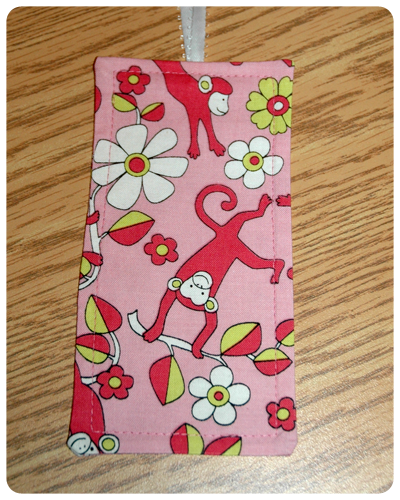 I had a piece of fabric 14 inches wide so I folded it in half with the wrong sides together, decided that this was long enough for a bookmark (7 inches), and cut a strip 4 inches wide. 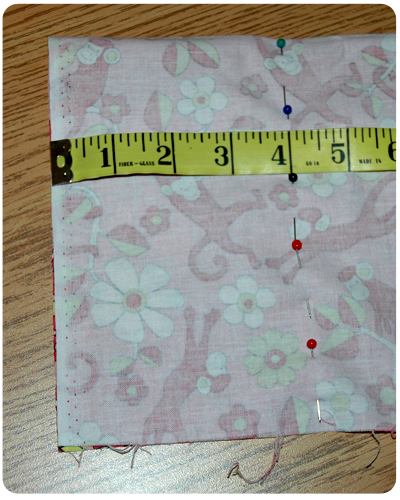 I then cut a length of ribbon and pinned it to the center point at the top of the bookmark on the right side of the fabric. After pinning the side and top seams in place, I sewed the edges together making sure that the ribbon was secured in the seam. I also left an opening along the one side seam to allow for turning. 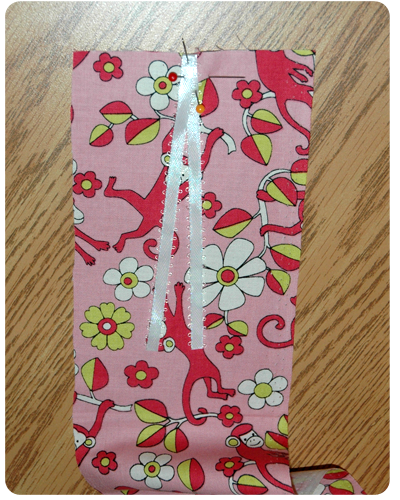 The ribbon was on the inside of my bookmark at this point, and the wrong side of the fabric was facing me. I trimmed the edges and turned the bookmark right side out. 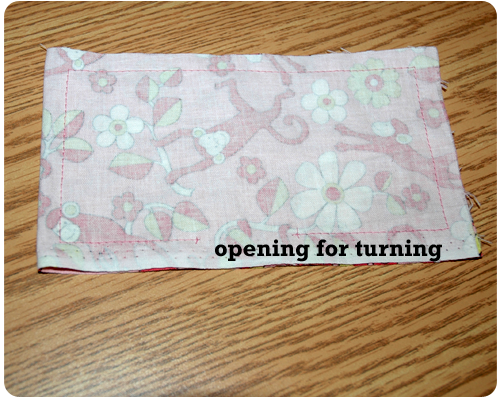 After slip stitching the opening closed, I pressed my bookmark and ran a line of top stitching around all four edges. All done! 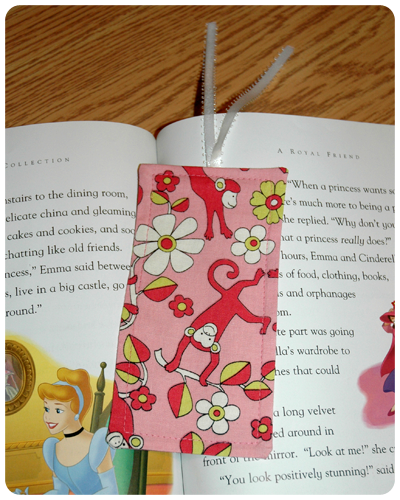 When Bridget was reading a Cinderella story later in the evening and she needed to pause for dinner, her new bookmark was ready to hold her place. A very simple project requiring very few supplies. And a great way to celebrate and encourage reading. It is week seven of the one pad challenge and I am still going strong. I still love the paper that I am using - Indie Bloom by Basic Grey. 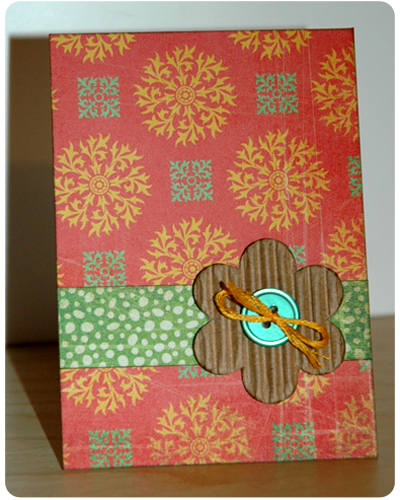 And I am still having fun combining the different papers together to make lovely cards and tags. I have always loved grid style cards. They are simple, clean and classic. I am very happy with how mine turned out...it makes me "smile". 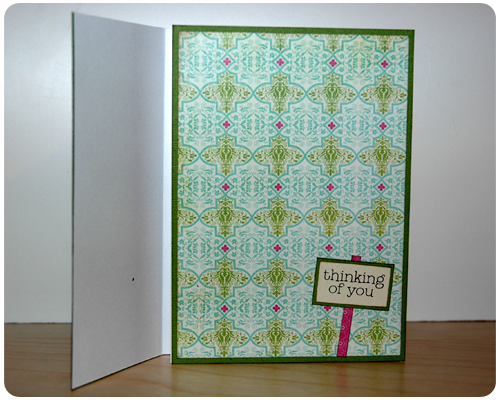 This "thinking of you" card opens first to the left and then to the right....a little different than most cards but something I like to do every now and then for a little variety. 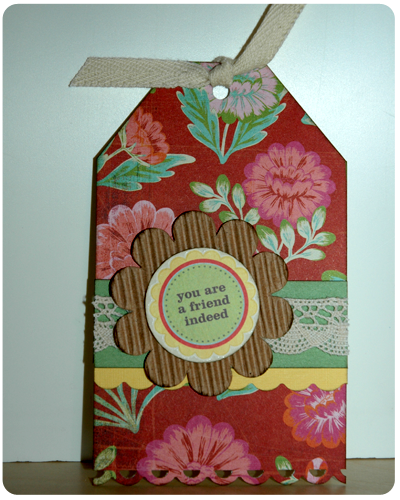 I also made a few tags this week to help use some of the smaller scraps of paper that I have leftover. 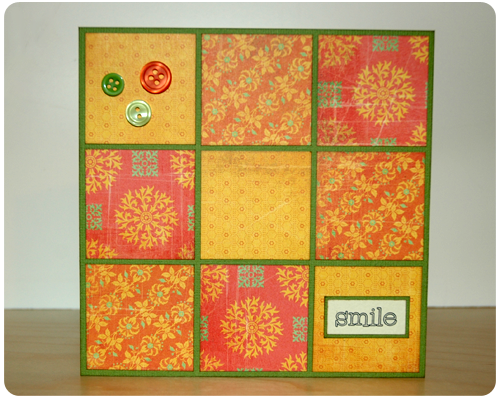 This weeks' creations bring the total to 18 cards and 5 tags. With more to come next week...see you then. One thing that I have found in making cards from the same patterned paper every week is that my card making time is incredibly focused. 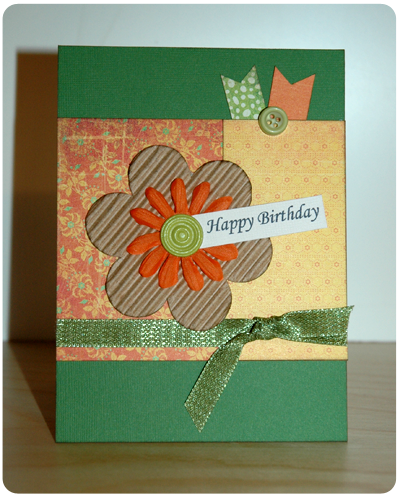 I already know what paper I am using, so more of my time is spent making cards rather than rooting around for supplies. 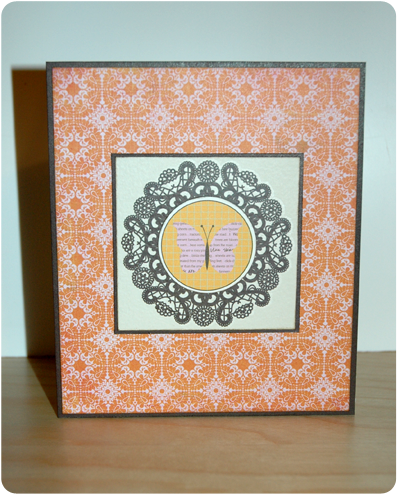 I also spent a few moments early in this challenge looking through my embellishments. I have a pile of them on my table that "might just work with this paper" so I am always ready with all the little extras that make each card beautiful. I am thrilled with how productive I have been and love the results. 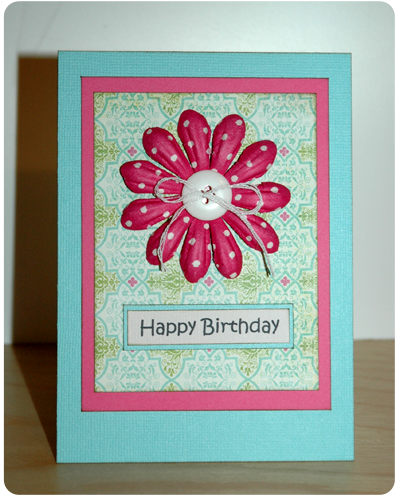 This card was a perfect way to use up some of the small scraps on my table. 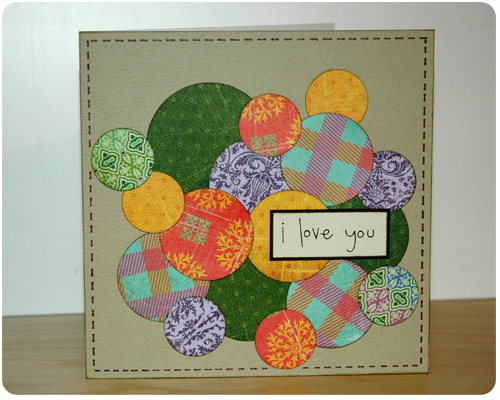 I simply punched out different sized circles and layered them. I love how it looks with all the different patterns together. 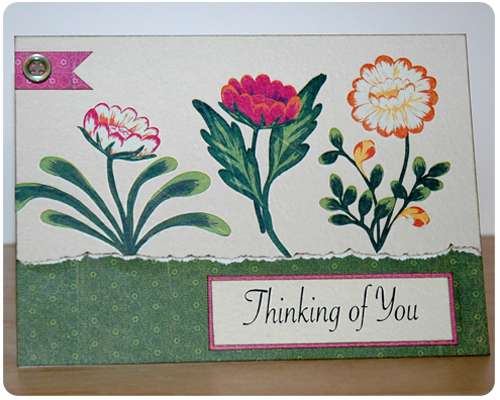 This small note card would be perfect to attach to the top of a present. And I absolutely love these flower rub-ons....nothing says thinking of you like flowers. That brings the total to 16 cards and 2 tags. Check back next week for more cards, and maybe even a few more tags. (To see what I created the first five weeks of this challenge, click "The One Pad Challenge" box on the sidebar).